Welcome to Jungle Supply Company, California's wholesale bamboo source. 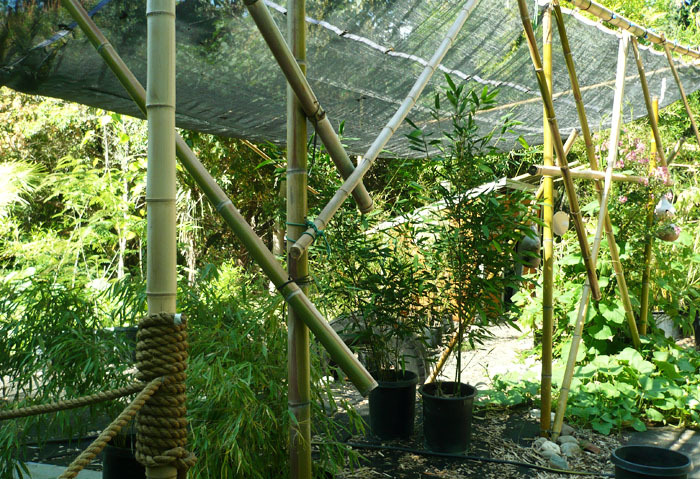 We are a premier supplier of live bamboo plants in Northern California, near Sacramento. We carry a variety of bamboo species, including giant cold hardy types. All of our bamboo is grown on site which allows us to offer organic top quality, low priced plants. Check out the contact us section for more details. Bamboo Plants - Over 50 Varities of California Grown Clumping and Running Bamboo. Bamboo Fencing - Black and Natural Fencing. Great green building material. Bamboo Poles - Tokin, Black, Spotted, Tre Gai, and GREEN Bamboo Poles. Top Quality! Bamboo Services - Bamboo removal and FREE bamboo delivery service. We are located in Newcastle, California, about 25 miles northeast of Sacramento. We are family owned and operated, a licensed nursery and a member of the American Bamboo Society. We are also a featured supplier with Complete Bamboo. Take a look at the about us section to learn more about our nursery. We are family owned and operated and have been working in the bamboo business for years. We offer other bamboo services such as bamboo removal and landscape consultation as well. Jungle Supply Company has the deepest admiration for Bamboo and the far-reaching benefits it provides our planet. Bamboo is truly a masterpiece of nature and it is our goal to introduce more people to its elegance and versitility. We are actively engaged in the Sacramento bamboo community and we are proud to be a member of the American Bamboo Society.